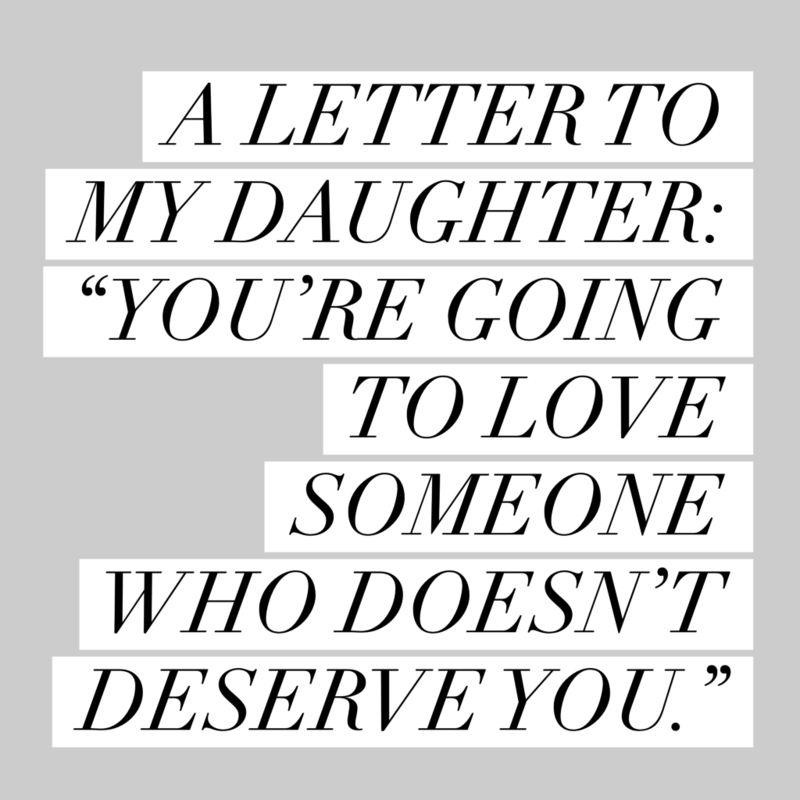 Sometimes I write letters to my daughter…one I don’t have yet, but someday expect to bring to life. It feels like a diary, a lesson, a glimpse into the life I lived before & maybe during her existence. I hope one day, when she feels like she’s a million miles away from me, dealing with experiences and heartache that I can’t begin to understand I can hand her this journal…giving her a literal piece of my heart and we’ll find common ground. This morning, while sitting in my favorite coffee shop, drinking my favorite latte and trying to focus on work I suddenly found myself a witness to a mother calmly trying to soothe her inconsolable daughter. Bits of the conversation provided enough information for me to understand that the daughter’s heart was broken and the mother was trying to pick up the pieces. I put down my coffee and I wrote this letter. I imagine you often…as a baby, as a curly haired toddler, as a grade school spelling bee champ but mostly as a young woman. I imagine you’ll have your dad’s eye lashes, long and thick and irresistible. You’ll probably have his dimples too and his charming grin. I sure hope you have his metabolism! But, I imagine you will have my eyes…blue and clear and nothing short of a precious gift that your grandparents contributed to. When I picture those big blue eyes, framed with your daddy’s lashes…I dread the day I see them filled with tears. I wish I could tell you that life is going to be nothing but good to you. I wish I could say that your good heart, your sweet smile and your fascination with everything will be enough to spur only goodness from those around you. I wish I could tell you that you’ll have nothing but wonderful friends, attentive and gentle lovers and co-workers and bosses who will be nothing but grateful for you. I wish I could say you won’t have to hurt. I feel like you must be warned…you’re going to love someone that doesn’t deserve you. It doesn’t matter how smart you are, how independent and strong your dad and I raise you to be or how determined you are to only let “good” people in. Friends are going to hurt you, co-workers, bosses, peers, family and sometimes even me. But the biggest hurt of all will be those you love intimately. That person you love with passion, exuberance and endurance. You’re going to love someone who turns cold and distant and is always pushing you away. You might love someone who’s eyes wander and can never settle on yours exclusively. Sometimes the less they love you…the more awful they treat you….the more you’ll want them. Sweetheart, sometimes love can feel a lot like a game…like a game that you must win. And with that mindset you’ll do some ridiculous things, tactics you never felt capable of. You’ll want to be ashamed of yourself. Someday you’re going to come home, to the house in which I raised you and you’re going to throw your arms around me and bury your face in my neck. You’re going to cry, maybe even sob, and you’ll probably leave mascara stains on a new silk blouse, but I won’t care. You’re going to wonder what you’re missing, what you’re doing wrong, why you can’t make this person see how lovely you are, how much you care, how great you could be together if they would only love you like you love them. I know it sounds awful. I have a good reason for writing this down, for reducing myself to tears at the very thought of your pain. You’re going to find someone who deserves you. It might take years, several relationships, even a marriage and consequential divorce. They are going to be incredible. Like you. They’ll love you like sunshine, reaching every bit of you inside and out. They’re going to laugh at your jokes and revel in your stories no matter how small. They won’t mind that you hog the bed and they will sacrifice some of the blankets so they can watch you, lovingly, all wrapped up and cozy. They’re going to memorize your favorite foods and restaurants and drinks and clothing stores and all of the things you “can’t live without”. They’re going to tell you that you’re beautiful when you get dressed up for a night out, or when you’ve just woke up, or when you’re caught right in the middle of a horrible flu bug. They’ll fill up your humidifier when you’re stuffy, they’ll scrape off your car when it snows, they’ll hold your hand (and sometimes your entire body) in their lap while you watch a scary movie. They’ll only raise their voice when it is absolutely necessary and you will never sit staring at the phone wishing they would call. You’ll never feel small in their presence, you’ll never feel like an imposition. Your love story is going to be epic. I can’t wait to watch you thrive in it. And all of those people who didn’t deserve your love…they’re going to make you appreciate the one who does.